Factory class to produce BaseIVFABs. Factory class to produce BaseIVFABs. This is needed for LevelData construction. 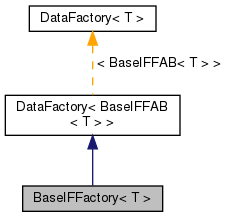 References LayoutData< T >::boxLayout(), LayoutData< T >::dataIterator(), LayoutData< T >::define(), BaseIFFactory< T >::m_ebisl, BaseIFFactory< T >::m_facedir, BaseIFFactory< T >::m_sets, and LayoutIterator::ok(). Implements DataFactory< BaseIFFAB< T > >. References BaseIFFactory< T >::m_ebisl, BaseIFFactory< T >::m_facedir, and BaseIFFactory< T >::m_sets. Referenced by BaseIFFactory< T >::BaseIFFactory(), and BaseIFFactory< T >::create().